Red chalk, 20.8 x 28, large part of upper left corner missing and filled, and upper and lower right corners missing and filled. LITERATURE: Berenson, 1903, 1938, 1961, no. 2456, as Rosso. Kusenberg, 1931, 155, no. 39, as not by Rosso. Barocchi, 1950, 203, Fig. 177, as Rosso, Florentine period. Carroll, 1964 (1976), II, Bk. II, 512-513, F. 52, Bk. III, Fig. 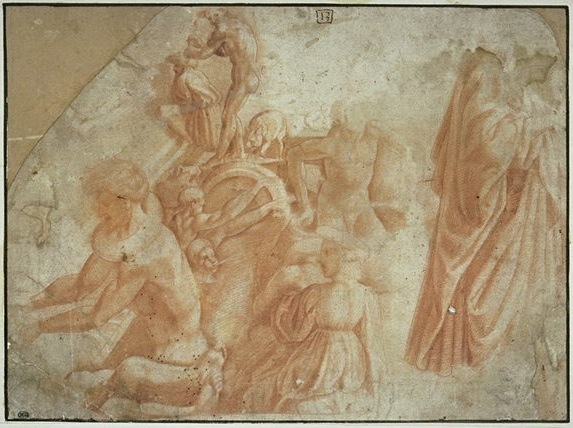 206 (recto), the recto hesitatingly attributed to Vasari. Ragghianti, 1972, 65, n. 18, as too weak for Rosso but it may show his interest in quattrocento perspective. Nyholm, 1977, 153, as Rosso. Falciani, 1994, 23, n. 3, as Rosso. Only the recto of this sheet has been considered in the literature. 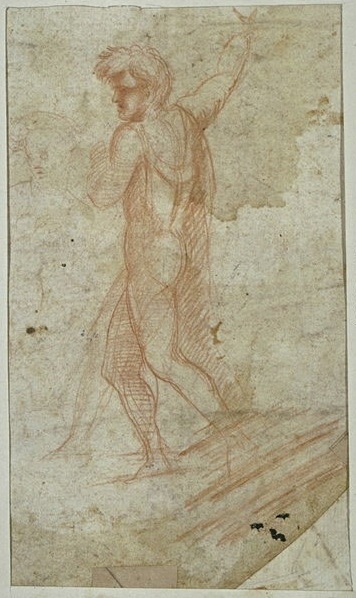 Graphically there is no reason to attribute the belabored copy of the recto of this sheet to Rosso, and the verso, by the same hand, it would seem from the appearance of the head of the main figure, although more lively and not recognizable as a copy of a known composition, cannot be associated with any manner of Rosso’s drawing. 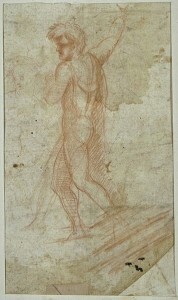 The recto is by a serious but not especially talented student who, from the drawing on the verso, reminds one of Bacchiacca.